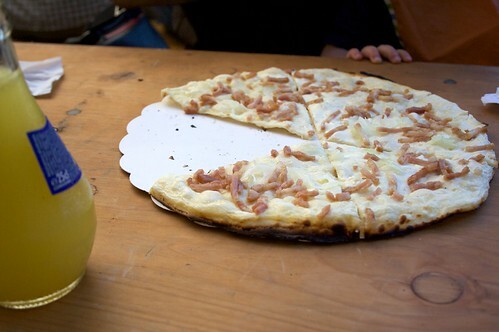 La tarte flambée, or flamme-küche, is a speciality from Alsace. Imagine the thinnest pizza base covered with crème fraîche, lardons, onions, and if gratinée, rapé. In the oven, and oplà, piping hot under your nose! I’m a speaking a strange language? Yes, I know and it’s called French! Crème Fraîche: it’s basically a very thick (aka very fat) and not so acidic sour cream. They make a thin layer of it over the pizza base. Lardons: it’s stripes of think bacon, not smoked. They lay them over the crème fraîche. Onions: they cut them thinely but not to much, and they go on the same layer of lardons. In case the tarte flambée is gratinée, over the crème fraîche they put a layer of rapé, grated gruyere cheese. 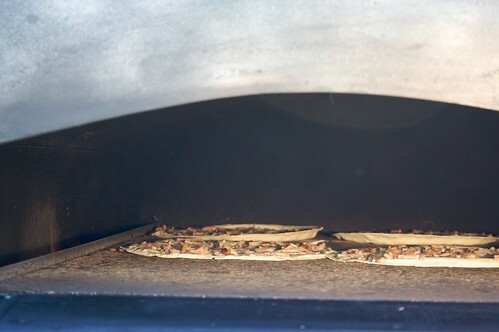 They are cooked in wood or electric oven, at a very hot temperature, like pizza. It’s one of the most delicious crunchy dish I’ve ever tried! That tart is a thing of beauty. I could not only start with it – I could eat it all and consider it my 3-course meal.